Master’s degree in Engineering (MENG) in Information Systems from the University of Surrey in England (1992-1997). His professional career began in the IT department of Deutsche Bank in Frankfurt, where he worked as an analyst-programmer between 1997 and 2001. In 2001, he joined IBM-Barcelona as a senior consultant and head of IT and new technologies projects. In the institutional arena, in September 2005, he held office as a councillor in Sant Cugat City Council, where he worked until 2013, reaching the position of deputy mayor for Governance, Safety, Mobility and Technology. During this period, he was a member of the Board of Administration for LocalRet, a Catalan municipal consortium for the information and knowledge society, from 2007 to 2013. 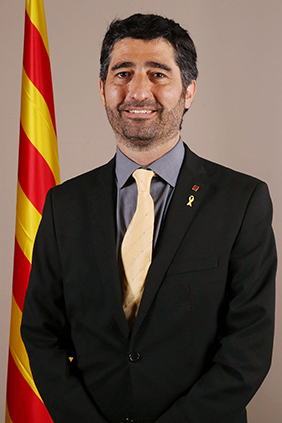 From November 2013, he directed the ICT policies of the Government of Catalonia, first as Director-General for Telecommunications and the Information Society, and from February 2016 as Secretary for Telecommunications, Cybersecurity and the Digital Society of the Government of Catalonia. As head of Cybersecurity Policies of Catalonia, he is also president of the Centre for Information Security of Catalonia (CESICAT).